Come join us on Tuesday morning for an always interesting discussion on a variety of topics! We meet at 10:30 am in the Trinity Chapel. We read books and discuss them, look at interesting videos and discuss them and we sometimes just talk about things that are meaningful to us. Trinity is in its 66th year! 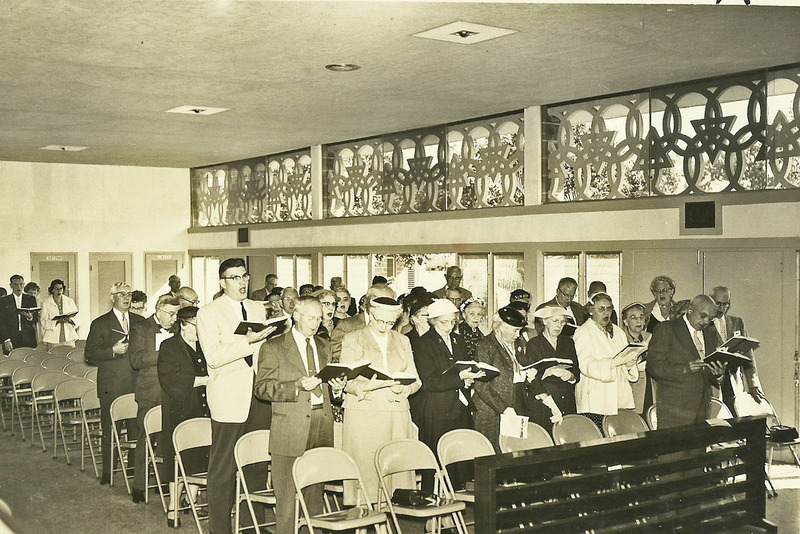 The first service was held on December 21, 1952. Read about this first service and many other interesting developments during those initial ten years on our History page. Check out our latest addition---the Florida UCC's newsletter, Celebrate Florida! on line! 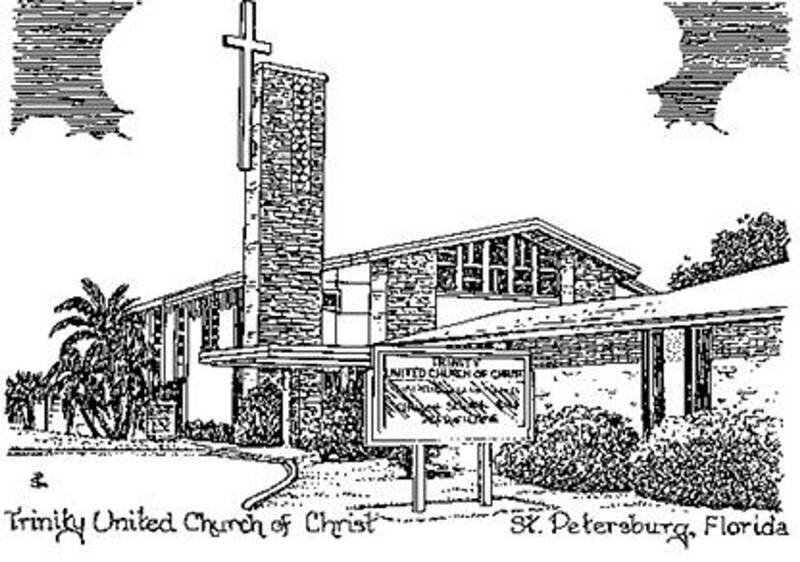 Find out what is going on around the state at our sister UCC churches! You might even see our campus in the latest addition! See page 12! Click here to link to newsletters. We have a calendar that shows "who is meeting where' each month. With four different ministries, it can get a bit confusing. Just go to the Calendar tab on the left hand side of the page and the drop down will say "Room Usage Calendar." Our congregation has again taken the Lenten Challenge! 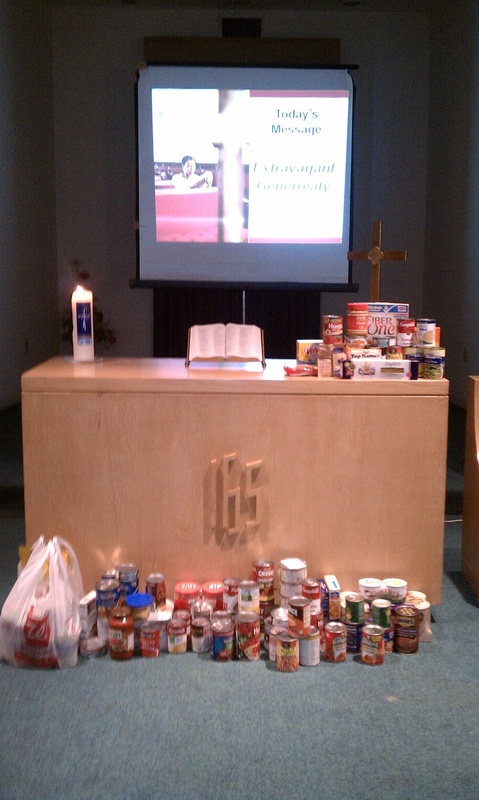 There are 40 days in Lent and we challenged each family to donate a food item each day! As you can see from last year's the picture to your left, many folks participated in 2018 and the challenge was met! We are hoping for another successful challenge this year! The food goes to the Good Samaritan Food Pantry in Pinellas Park. 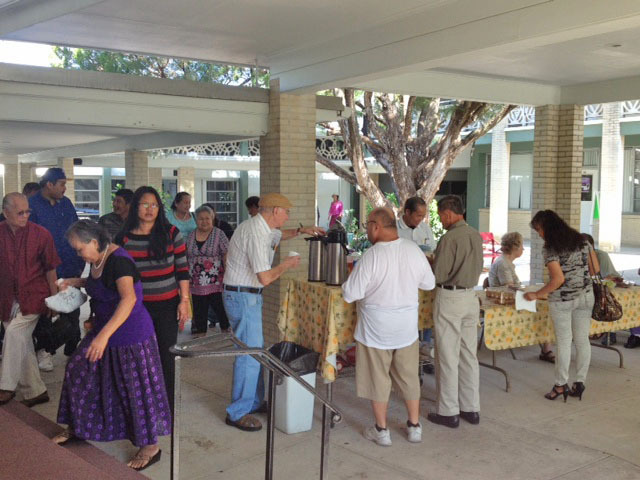 Thanks to all of the generous hearts who attend our church! As part of our Mission 1 effort in the fall of 2011 we began collecting can goods and other non perishable items that can go to feed the hungry in our county. Our goal was to collect 111 items by the end of the month and we collected over 300. The items went to our sister church, Good Samaritan in Pinellas Park. "Good Sam" has had a food pantry for 45 years and serve approximately 2800 people a year. They are open Monday, Tuesday, Thursday from 9:00 am to noon and accept monetary donations as well as goods. Helping Good Sam in 2011 started a great tradition! We have kept it going by continually donating to this very worthwhile project so please keep bringing in those canned goods, peanut butter and paper products. Good Sam is very appreciative!! The items can be placed by our worship table in the Chapel. For more information about the Good Samaritan Food Pantry, click here. In 2015, we became part of the Family Promise program. As a support church, we have agreed to support a host church four weeks a year in helping shelter and feed a homeless family. Our host church is Palm Lake Christian Church. Family Promise provides temporary housing to Families with children who have lost their homes. They are a nonprofit, non-religious charity who primarily works with faith-based institutions to accomplish their goals. Family Promise helps families without homes regain their independence. The goal is to help provide the families with a secure, safe, temporary environment while the parents work with case managers, counselors, and service agencies to return the family to a stable home and a healthy, sustainable lifestyle. 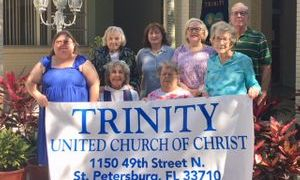 Trinity UCC is proud to be part of the effort to help the homeless in Pinellas County. For more info on the Family Promise Program, click here. 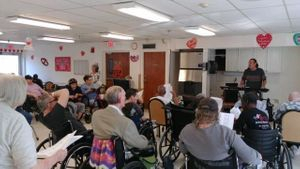 We have established an on going ministry with a local nursing home, Jacaranda Manor. We visit these lovely folks at least 4 times a year for planned events such as sing-a-longs. We also have made care packages filled with toiletries and other goodies. So many times, people living in nursing home situations are forgotten. 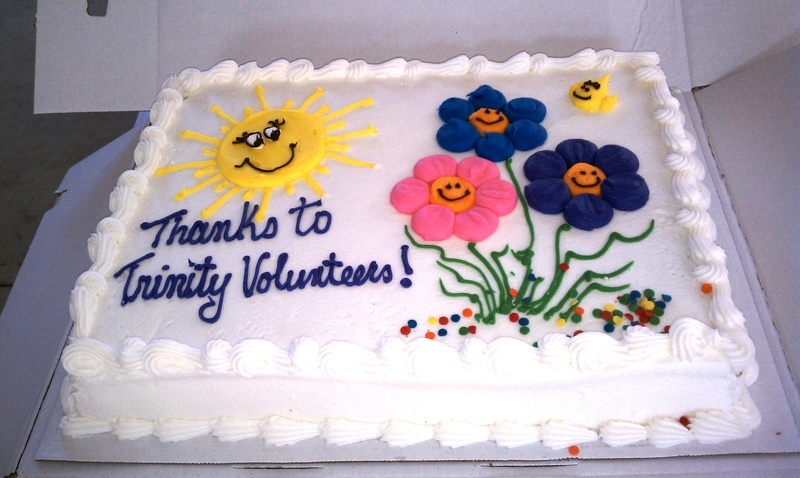 We have seen the joy in their eyes when we come to visit and encourage anyone in our community to reach out to a nursing home to volunteer. You won't be sorry you did! 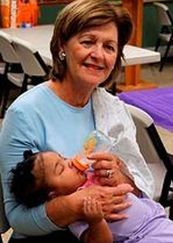 Jacaranda's caring activity director, Barbara, has made working with them so easy and fun. Many thanks to the wonderfully committed staff at Jacaranda and for the members of our congregation who attend these wonderful outings! The address is 4250 66th St N, St. Petersburg, FL 33709.